This is not your yearly dose of Dennis Dugan's Adam Sandler if that's what you're thinking. No, as big as Pixels looks in its marketing it actually is on the big screen. There seems to have been no expense too big, which includes flawless special effects, big action set pieces, legitimate craftsmanship and, unfortunately for Sandler, the hiring of quality actors to play opposite him that only stand to make him look all the more lazy. While this isn't your typical Dugan/Sandler fest in the vein of Grown Ups or Jack and Jill it is still Sandler phoning it in, doing what he's done every summer since about 2002 when Mr. Deeds more or less set him on a patterned course. There have naturally been deviations both in his comedy and into more serious territory since then, but the comedian always returns to his safe zone and delivers exactly what he believes his teen and contemporary audiences want from him. 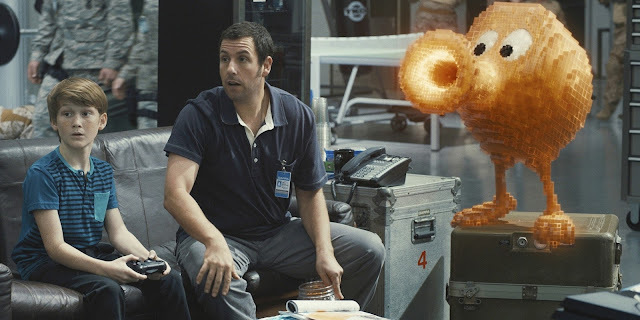 There is too much going on in Pixels for this to count purely as another Sandler bomb though and fortunately Pixels won't be judged on the immediate reactions of modern critics looking to dismiss the movie because of a single component before even walking into the theater. It is sometimes shocking, the vitriol which is spewed in Sandler's general direction, but I admit the majority of it is well-founded. With Pixels though, it will be the children of today who truly define what role this film will play as part of our pop culture society. In case you are unfamiliar with the name Chris Columbus (and no, not the Italian explorer) he is the guy that brought to life some of my generations favorite childhood films whether they be both Home Alone 1 and 2, Mrs. Doubtfire or even the first two Harry Potter films. Columbus has a knack for tapping into what makes kids enlist their truest sense of wonderment and he seems to have modernized that technique here while still remaining true to the decade that gave him his start. I'm not saying Pixels is as good as anything else in Columbus's filmography, but I am saying kids will love this movie and likely champion it through their teenage years and into their twenties as a haze of nostalgia will keep their love of it intact. Matty (Matt Lintz) schools Sam Brenner (Adam Sandler) on the tactics of modern gaming. So, while these words I write will have little to no impact not only on anyone venturing out to theaters this weekend, but also on those who will find something of a comfortable affection in the film fifteen years from now I have to wonder what the point in saying anything about the film is. If you are here simply looking for information about the movie the fact is you probably already know it stars Adam Sandler and that may or may not be enough to sway you in either direction, but if you're looking for things you might not know, here are a few: Pixels has a good premise. It is actually based on a short film from 2010 directed by Patrick Jean. Jean doesn't seem to have been consulted on this version of his initial idea, though I'm sure he was handsomely compensated for his initial contribution. Instead, Columbia hired writers Tim Herlihy (a regular Sandler collaborator) and Timothy Dowling (Role Models, This Means War) to flesh out a long-form story for the concept and what they came up with were aliens misinterpreting video feeds of classic arcade games as a declaration of war, thus attacking Earth in the form of those games. Still pretty solid, right? Cool. To preface this whole "end of the world" scenario Herlihy and Dowling introduce us to a couple of kids from the eighties who just so happen to also be the arcade game champions. There is of course Sam Brenner (Sandler) who picks up on the patterns of Pac Man, Centipede and Galaga instantly and his best friend Will Cooper (Kevin James) who's not great at games, but is pretty solid with the claw and grows up to be the President of the United States. Let that sink in. Past it? Okay, there is also wunderkind Ludlow Lamonsoff (Josh Gad) who is a gamer and major conspiracy theorist as well as Eddie "The Fire Blaster" Plant (Peter Dinklage) who beat Brenner at the 1982 World Championships, but has since been imprisoned for fraud or something like that. Why he's in jail doesn't matter, only that he wants to get out and get with either Serena Williams or Martha Stewart. Still going with this? Sweet. These are the guys that are going to save the world-cue the Cheap Trick! If you thought Target was offensive to women, wait until you get a load of Pixels. Yeesh. The females in this film are so one-note and serve the purpose of only being literal trophies for the male leads that I forgot to mention Michelle Monaghan actually has a fairly large part in the movie. As Lt. Col. Violet Van Patten, Monaghan is a kind of weapons specialist who supplies the "arcaders" with unique weapons that help them fight the aliens. It's not that all of the details have to necessarily make a lot of sense, but we hardly get an explanation at all when it comes to these defenses (much less anything else). There is something of an effort in the first round when Monaghan's Van Patten takes the gamers through her top secret lab and explains how they created technology similar to that used in the games, but by the time we get to the Pac Man sequence she might as well have said, "the cars will work because they're the same colors as the ghosts." Monaghan is a strong female presence and more than a solid actress, but after the one-two punch of this and last years The Best of Me it may be time for her to find a new agent. Then there is the wasted talent of the hilarious Jane Krakowski (30 Rock, Unbreakable Kimmy Schmidt) who plays the first lady and is seemingly only present to cling to Kevin James's arm and bake a cake with him. It feels like there was more of a story to Krakowski's role that was left on the cutting room floor, otherwise I find it hard to believe she'd show up for a weeks worth of work. And then there is Ashley Benson (Pretty Little Liars, Spring Breakers) who exists purely as a figment of Lamonsoff's fantasy world. As Lady Lisa, Benson is required to strut around in a skin-tight red dress and wield samurai swords for little reason other than delivering Lamonsoff a reward for helping to save the world. There is a caveat in the challenges from the alien invaders that anytime the humans win a battle they get to keep a trophy which results in Q*bert becoming a comedic sidekick, but by the end (Spoiler alert!) sees him sacrificing himself for the sake of Lamonsoff's weird fetish. Col. Violet Van Patten (Michelle Monaghan), Brennar, Ludlow Lamonsoff (Josh Gad) and Q*Bert band together. As awful as I may have made this movie sound so far, I swear to you that kids will still have a good time with it. There is a fondness for the generational gap that separates the makers from the intended audience (though I can't fathom why they went for a PG-13 with this). Sandler and Columbus know a thing or two about nostalgia as they now seem to gloriously admit to loving everything about the eighties simply because of the time it represents in their lives. They seem to want this to become true of their movie because even if they know it's not the greatest thing at the moment, the kids who take it in today will hold it close to their hearts when this year has long passed and their movie becomes a part of the memories that made the summer of 2015 a memorable one. That may be giving Sandler too much credit though as he's never looked as tired or felt more out of touch with reality than he does here. What's worse is that as fine as this movie is when it comes to kids entertainment, it could have been so much better. Both Gad and Dinklage create fully-formed characters who have a few successful comedic moments (though the one where Gad sings Tears for Fears is just awkward) that genuinely made me laugh. Still, Dinklage is hardly in the movie after his introduction more than a half hour in and Gad is so spastic and unpredictable in his somewhat bipolar antics that it's hard to gauge what exactly his character arc was meant to be. Either way, the effort these guys along with Monaghan and even Brian Cox (though his character is about as well developed as Krakowski's-what was that scene of him sitting alone at his desk looking all evil?) put into their performances make Sandler look all the more lazy by comparison. Writing through my thoughts on the film have certainly caused me to reflect on the number of issues it has that I didn't initially take issue with. Still, it is hard to challenge the level of entertainment and fun that can be had with Pixels if you go in with the mindset it expects from you. After all, kids and general moviegoers don't care if Sandler gives a performance or if he's coasting. If there's a good performance to be seen, they'll recognize it, but if it is nothing more than what they're accustomed to and the movie is entertaining enough they'll let it pass. 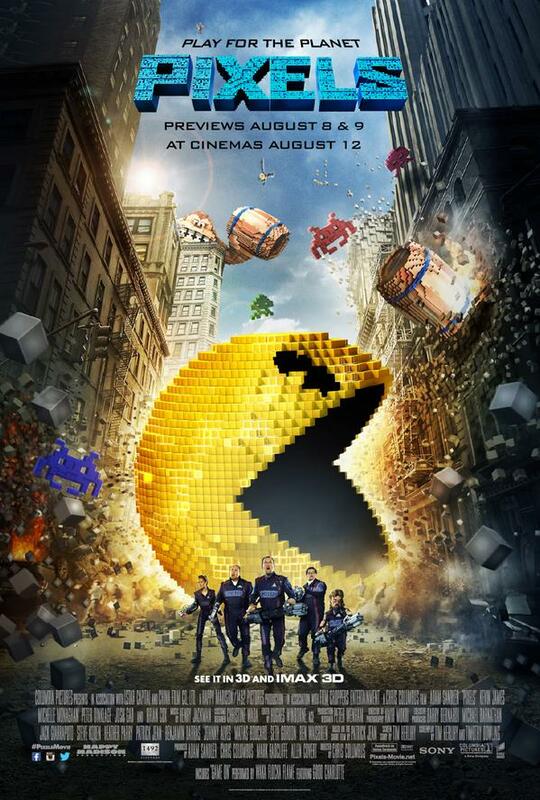 Pixels gets a pass.